so the ECU is the problem? Can i fix it? The suspect is the MAF or the connection to it. I forget to mention the cruise control not working too. A 95 has a separate computer for the CC. You'd better to read this first. I have written several times before about the capacitor's selection. You need to study a lot about the Bode plot and measure the actual circuit, if you want to use non recommended capacitors. Too low ESR capacitor often causes problems of stability or RF oscillation, you know. Without analysing the relationships between the phase and the gain of the error amplifier, the person would have very hard time to compensate. Of course it would be nice if you were planning to use non recommended ones and inform us the result with the chart. Yamae, do you have any chart with ESR values, which is the best for capacitors? I'm asking this because I found few of charts with different values, I would to like measure capacity and ESR before replacing capacitors. Sounds like you still need to study the Bode plot some more. Those who understand it would never ask such a strange question. Ok.. I can change capacitors without measure them.. I just want to make sure, that new capacitors is better condition than old.. I think sometimes you can get bad/defective new capacitor and make everything worse after replacing them. I just want to make this task 99% good. Can anyone recommend a company I could send my California 1992 LS400 non traction control ecu to, that would do the best job? Surging on accelleration, some popping noises, and worse when not totally warmed up. Previously have replaced spark plugs, plug wires, caps, rotors, fuel pump, fuel filter, coil packs, fuel strainer, cleaned throttle body, replaced mass air flow sensor, and have run separately through three tanks of gas, techron, sea foam, then Lucas fuel system treatment. 2jzgte ecu capacitor location and value? Wrist straps are flexible conductive bracelets with a snap on conductive wire that is used to discharge any static electricity that you may on your body that would arc to the electronic ICs that are on a board you may be working on. Many work stations that are used in prototyping circuit boards (CBs) or even reworking CBs have a metallic or conductive work surface that the wrist strap is connected to. The wrist strap wire is connected to this conductive surface. 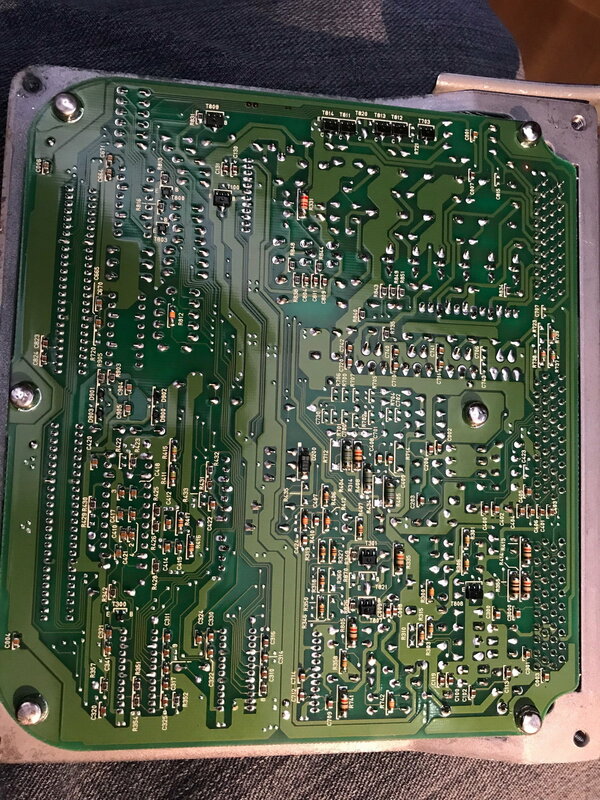 When the circuit board is placed on the surface it is assumed to be at the same potential so touching components on the board will not result in a discharge and possible failure to ICs. Long explanation. A picture would be better. Another technique that I haven't seen used by anybody so far is solder wick. One of the most destructive procedures for removing radial caps in platted through holes (especially in multilayer boards) is trying to extract the caps without damaging the plated hole. The hole is connected to internal layers where the plating is thin. If most of the solder is not removed or kept liquid the hole can be destroyed by being pulled out as the cap is removed. Solder wick is braided copper strips that have been impregnated with a flux that is activated by heat. The strips come in various widths from 1/16 to 1/4 inch and is rolled up onto a plastic spool. By placing a piece of the strip on the back of the board where the tip of the cap comes through the board and heating it with the soldering iron the solder will literally be wicked away much like water is taken up by a sponge. In most cases there is very little if any solder left on the lead or the hole and the cap leads can be teased away from the hole with the iron. Any solder left on either side of the board can be cleaned up with the wick as well. I've had good luck with solder wick with surface mounted components as well. My 1995 SC300 has 89661-24370. (maybe CA version?) Unfortunately I cannot see 1 of the CAPs, so after reading numerous pages of this thread, realized that I'm close to -24350, so with the total cost of $14 including shipping, just buying 2 of each..
and one unknown.. I'm pretty sure it's one of the above, so buying 2 of each. In all the threads, I've never seen 3 of one kind. The reason I cannot see 1 of the CAP's is because one side of my circuit board the philips screws are soldered over. This "looks" like it was factory, but has anyone seen this? All 6 screws are soldered over, so will be difficult to remove them. Impossible to put the same ones back in. I may be wrong since I only have rebuilt 93 and 94 LS400 ECUs but there are screws on the other side that hold another board. You take off these screws and fold back a flex cable that attaches both boards to expose the caps.These are not soldered if your ECU is like mine.